As a weather system from the west moves over Washington's lowlands Thursday, including Seattle, winds and a chance of showers will gradually clear the air, meteorologists say. Seattle’s air quality is improving. Falling ash and smoke from wildfires across the Pacific Northwest have filled Washington skies since early this week. But as a weather system from the west moves over the state’s lowlands, including Seattle, winds and a chance of showers will gradually clear the air, meteorologists say. Conditions will get better in Western Washington throughout Thursday. That outlook depends on where you are. Air quality in Eastern Washington — where multiple wildfires have threatened homes, prompted evacuations and caused Gov. 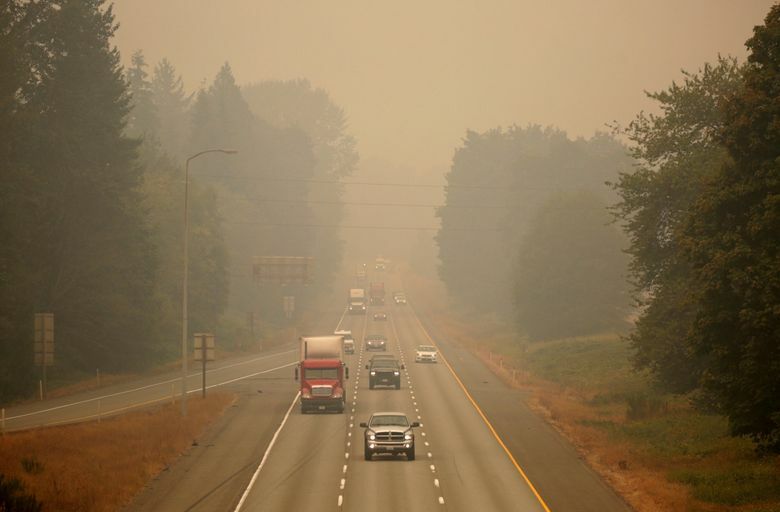 Jay Inslee to declare a state of emergency — remains at unhealthy levels, according to state ecologists. Children, the elderly and patients of respiratory illnesses are most at risk of serious health effects from poor air-quality. Those groups should limit their times outdoors. Like Thursday, Friday’s forecast for Seattle calls for a chance of showers, with a high temperature around 74 degrees. Saturday’s outlook is about the same, with slightly cooler temperatures. Then, partly sunny skies will brighten the metro area on Sunday, according to the service’s extended forecast. The ash and smoke, which filled Seattle skies since early this week, was unlike anything the city has seen before. Even when Mount St. Helens erupted in 1980, Seattle did not get a similar sort of covering, with the ash blowing south and east, according to many people who lived here during the event. Material from The Seattle Times archives was used in this report.